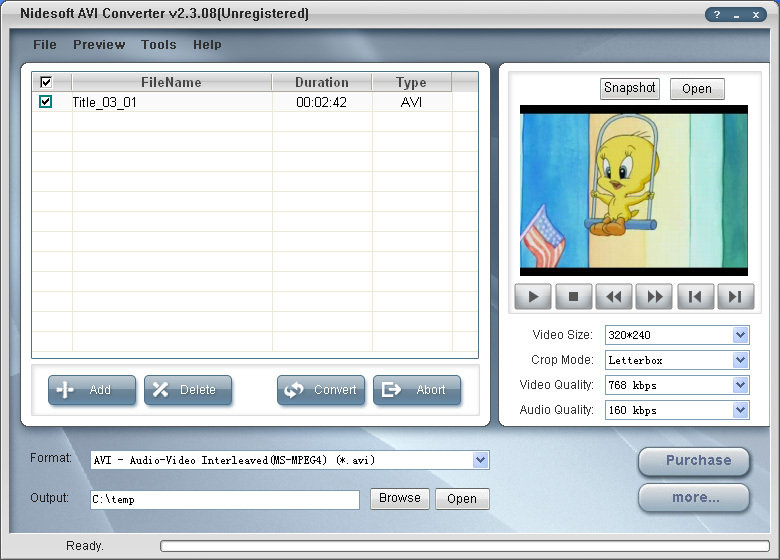 Nidesoft AVI Converter is a powerful Video Converter software for AVI conversion. It could convert almost all video files to AVI format, including MPEG, VOB, WMV,MP4, MOV, 3GP, FLV, etc.. In addition, Nidesoft AVI Converter can be used like AVI to iPod converter, AVI to iPhone converter, AVI to PSP converter, AVI to 3GP converter, AVI to MP4 converter, and AVI to Zune converter, etc..
As the best AVI Video Converter, Nidesoft AVI Converter provides many advanced settings such as select video resolution, set the video bitrate, audio bitrate and the crop mode. 1. Support converting AVI to Video, AVI to Audio. 2. Support convert movie to AVI format. If you want to save the image from the playing video, you could try the ?Snapshot? function. next to ?Snapshot? button to open your picture. converts Images to Avi movies. Create slideshows timelapse movies and more. Qweas is providing links to Nidesoft AVI Converter 2.3.56 as a courtesy, and makes no representations regarding Nidesoft AVI Converter or any other applications or any information related thereto. Any questions, complaints or claims regarding this application Nidesoft AVI Converter 2.3.56 must be directed to the appropriate software vendor. You may click the publisher link of Nidesoft AVI Converter on the top of this page to get more details about the vendor.